Hat made from high-quality single layer cotton with little elastane. This combination provides a soft flexibility and comfort. Interesting embroidery detail on the hat adds to its charm. 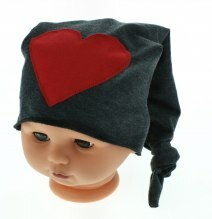 Ideal for walking, protect baby's head from the cold and wind. Made in Poland and Polish cotton having numerous certificates.